Some of you recognize me, some of you don’t. My name is Jason Alt and I am a writer and podcaster. I’m also the content manager here at EDHREC. What does that mean? Basically I’m in charge of wrangling the talented individuals who are going to be contributing articles to the new content wing of EDHREC.com. This is going to leave everyone else free to continue bringing you the same fantastic analytical and aggregation tools that you have come to rely on. Nothing you like about EDHREC is going away but we are happy to bring you some new offerings that we think you’re going to really like. So what’s new? Well, the first thing we’re adding is article content. Some of the offerings will be a bit general but others will be specifically tailored to the needs of EDHREC users. Our goal is to help you all get the most out of the site so that you will keep coming back and you’ll tell your friends (and the people you play Magic with. Anyone who has ever been locked down by Smokestack, Tangle Wire and Tectonic Instability knows that the people you play Magic with aren’t necessarily your friends) about us, too. Different people have different needs and they use EDHREC in different ways. Players who are looking for help building a deck based on a known commander can just search for a commander on the EDHREC main page. This brings up the page for that commander. You’ll see how many others are building that deck, get a list of those decks from sites like Tappedout.com and you’ll see the relative popularity of the given commander. It’s looks like Yidris is very popular this week, ranking between second and fourth in popularity. You don’t get much more popular than that! Scroll down a bit and you’ll see even more information. It looks like Kaladesh gave us a few new cards to go with this deck. 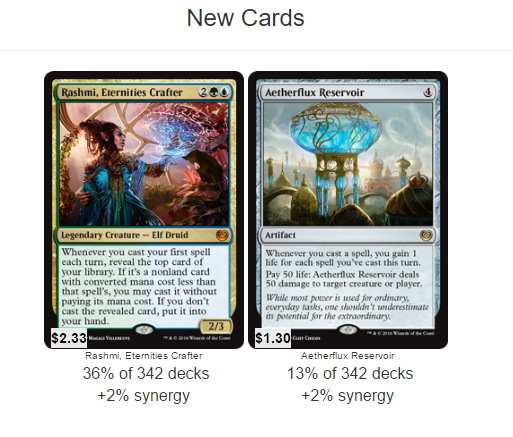 It looks like over a third of people building a Yidris deck included Rashmi, Eternities Crafter in their build before submitting the list online and it looks like there is a 2% synergy score between Aetherflux Reservoir and Yidris meaning Reservoir gets played in quite a few others decks. In fact, if a card is used widely across the format, that synergy score can even be negative. These scores can tell you a bit about how many other people are making the deck building choices you’re considering. Now that you know what that means, you can interpret the most popular cards played in Yidris builds. We see wheel effects so people must be trying to make the most of Delve spells like Treasure Cruise and its ability to be played for cheap but still cascade into expensive spells. We see other cascade creatures and mana rocks and a little bit of evasion and removal. At a glance we already have a few ideas about how we should pursue the deck. Remember, this is EDHREC so those are mere recommendations, but that should be enough to get you started. But how are other people using the information? As some of you know, I didn’t get my start in EDH but rather in M:tG Finance. With my series on Quiet Speculation, MTG Headquarters and now MTG Price, I try to demystify the process of buying and selling a bit and my podcast, Brainstorm Brewery helps people play the game affordably by knowing the best time to buy and sell their cards or how to turn a stack of bulk rares into EDH staples. From the moment I found out about EDHREC, I have found it a very valuable resource. If I see a card start to increase in popularity, I know it’s better not to wait to buy it unless I want to pay more later. EDHREC also helps me identify whether EDH is responsible for a card’s price moving. A while back, the card Hall of Gemstone was moving up and went from around $0.25 to nearly $20 before settling much lower. Naturally EDH was blamed, but did the data really bear that out? A quick glance told me all I needed to know. A card only used in 331 decks wasn’t likely suddenly a $20 card overnight. Sure enough, it came out that people were using the card to try and hate Legacy Eldrazi and EDH wasn’t the culprit after all. Compare that to another card that spiked around the same time. Resources is played in roughly the same number of decks but has a much higher affinity rating (a whopping 39%) with a specific card – The Gitrog Monster. While Resources was around $1 that week and trickling upward, Hall of Gemstone spiked to $20 quickly then passed Resources on its way down. Knowing which horse to bet on really helped in that situation, especially when there was an opportunity to buy copies at $8 before they hit $20. Finally, EDHREC’s info has helped me figure out what’s going on with certain cards. Another financier sent me a private message a while back saying he noticed the card Statecraft was moving quickly but after reading the card and looking in a few discussion forums, he had no idea why. EDHREC helped me solve the riddle in seconds. One of these numbers is not like the others! Over half of the Zedruu decks are using this card and it’s basically not used in anything else, by the look of it. Knowing the card is unique to Zedruu told me that people were donating Statecraft to opponents in order to make their creatures deal no damage. A scroll down the Zedruu page confirmed that people were trying to win with cards like Azor’s Elocutors and Luminarch Ascension and Statecraft fogging them all day was a big help. How do you use EDHREC? Deckbuilding advice? Card ideas? Do you search for a card you like to see which commanders are using it? However you use it, know that we’re dedicated to making the site even better and the new articles section will only help you find new ways to make the most of EDHREC. I’m happy to be part of the team bringing the new content to you. If you’re interested in contributing, send me an e-mail at altjason17@gmail.com and we’ll talk. Welcome to the new EDHREC!